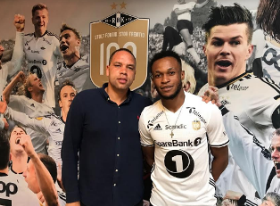 'Norwegian League Neymar' Samuel Adegbenro was impressive as Rosenborg beat Strømsgodset 4-1 to clinch the NM Cupen at the Ullevaal Stadion (Oslo) on Sunday afternoon. RBK were already crowned champions of the Norwegian Eliteserien prior to today's meeting against Strømsgodset. First half goals from Mike Jensen and Anders Konradsen plus a second half brace from former Arsenal man Nicklas Bendtner helped Rosenborg to win their twelfth Norwegian Cup. Adegbenro was lively throughout the 56 minutes he was in action and was only replaced after suffering an injury which required treatment on the pitch. The versatile winger was plagued by injuries for most part of the 2018 season, which limited his appearances to only seven in the Norwegian topflight. Ex-Nigeria U17 captain Igho Ogbu was not selected for the Norwegian Cup showpiece after featuring for Rosenborg U19s in the Norway Youth Cup final on Saturday.